It's always exciting to visit a restaurant where there is ample choice for vegetarians and so when I was invited to review a meal at La Tasca, I was very happy to discover that there were over twenty four dishes on the menu for vegetarians. My local La Tasca has been open for a number of years and I had visited quite a few times before this review opportunity and always had a good experience. La Tasca specialises in tapas, paella and other traditional spanish dishes. The idea of a Tapas meal really appeals to me as I believe that food is a social experience to be shared, although it sometimes can be problematic as a vegetarian if the carnivores also eat the vegetarian dishes and there isn't much left over for you. Thankfully my family are adept at eating out and sharing with a vegetarian and so I didnt have to worry about this at all during our meal. In Spain, many different Tapas dishes often create a main meal. As I like to try different foods, I much prefer the idea of a little of lots of food dishes rather than having one plated meal and indeed at home we often eat tapas (or buffet) style as I think it also encourages the kids to try new things as they have control over what they are putting on their plate. Booking a table at our local La Tasca was very easy and we booked for a Sunday lunchtime. When we reached the restaurant we were surprised to find that we were the only table there. We were welcomed by a member of staff and the children were able to choose the table they would like. As we had a Spanish student staying with us, we thought that this was the perfect opportunity to give her a taste of spanish food, english style and for her to tell us how true to traditional spanish food La Tasca really is. Spanish dining style is leisurely and laid back, and this is certainly what we found in this restaurant. The menu is so vast, that we were given ample time to make our menu choices and decide what we wanted to order. I started off with the obligatory glass of Sangria, and we also ordered other drinks which arrived swiftly at our table. 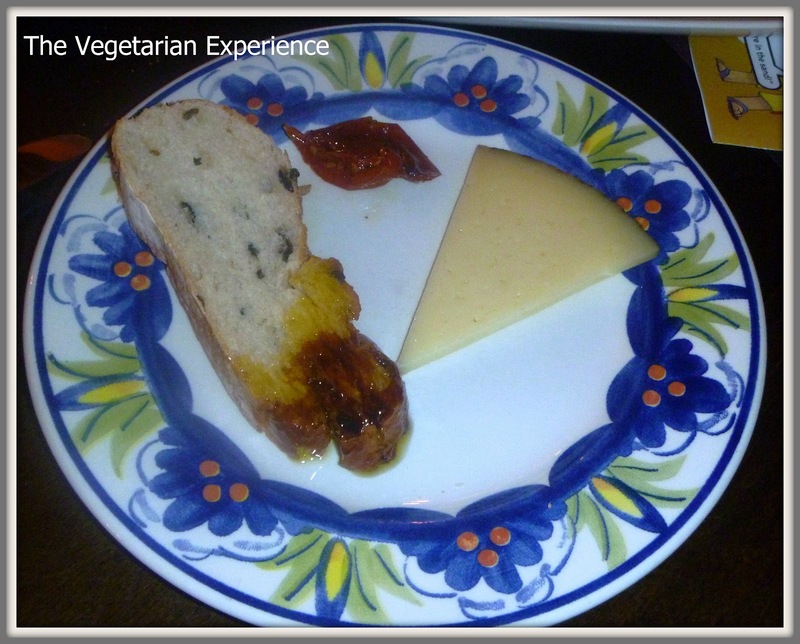 Whilst we mulled over our options, we ordered some a Spanish Rustic Bread Board and some Manchego Cheese to share. The bread and oil was so lovely and there was an interesting choice of different breads. The cheese was also really delicious and everything tasted very fresh. We were also very impressed with the new kids menu which La Tasca has recently introduced. Kids can choose three tapas dishes, a drink and a dessert for £5.95 which I think is excellent value for money. The kids absolutely loved their menu, and it was even better that they were given crayons to colour it in with also. They both chose non-veggie options. Eldest chose salad, chicken nuggets and chips. Youngest chose chips, manchego cheese croquettes and fish fingers. Both of their meals also arrived with an extra pot of peppers, carrots and cucumber, plus ample ketchup for dipping. Both girls absolutely loved the presentation and the tapas style food, with the board as it felt a lot more special to them than just being given a plate of food. The fish also looked as if had been cooked and battered fresh rather than being cooked from frozen. One thing I was particularly impressed with was that our server was very on the ball and brought the children's main courses whilst we were still having our starter - meaning that the children did not have to wait for the grown-ups before they could start eating. This is a huge bonus point in my book and one which almost every restaurant we visit fails to do. Armed with the spanish student to translate for us, we also ordered our main courses. Hubby and our spanish student chose an array of meat dishes, plus a seafood paella which hubby quite liked. However our student, who lives on the coast back home felt that the seafood in the dish was not fresh enough - and to her experience of fresh seafood and paella it probably wasn't, but to the english inlander it tasted good. 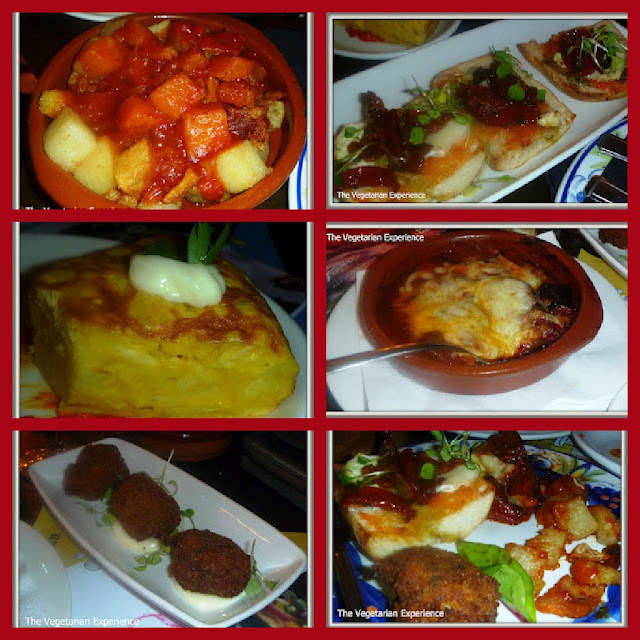 I chose an selection of vegetarian dishes including Patatas Bravas, Croquetas de Manchego, Tortilla Espanola, Montadito La Tasca and Berenjenas Gratinadas which were shared with the others on the table. All of the tapas was served piping hot and they all tasted absolutely delicious. I was in veggie food heaven! My particular favourite was the manchego croquettes and the aubergine berenjenas gratinadas. I really enjoyed the different tastes and textures of all of the different foods, and being able to offer the dishes round to everyone. This style of eating is certainly for me! After we had finished our main courses, there was a short interlude whilst we let our meals go down and considered the prospect of a quick siesta before desserts. However, the kids quashed our siesta ideas and we went on to order our puddings. Both girls chose a chocolate brownie and ice cream from their menu for dessert, which they both really enjoyed - as their empty plates were testament to. I opted for Arroz Con Leche - a spanish take on rice pudding, made with clotted cream, orange zest and cinnamon which tasted amazing!. I haven't had a dessert like it before and I was very impressed. Our spanish native opted for Churros which were a favourite of hers and she thoroughly enjoyed them also. Hubby, although full up, had a taste of everyone's desserts for the purposes of review of course. Our spanish student was very impressed with La Tasca, just as we were. Although admittedly some of the dishes were not as fresh or tasty as they are back home (probably due to different ingredients and product availability), she felt that the restaurant represented a true taste of spain and spanish culture and she was the most animated we saw her all trip! We really liked the restaurant, and the food. I think it is a great place to go with the kids during the day, and fab for a night out with the grown-ups in the evening. Price: The kids menu is competitively priced. It is hard to compare the main menu to others, as how much you pay depends on how much you order, but the dishes are reasonably priced, although it is easy to get carried away! 9/10. Ambience: I really liked the relaxed feel of the place, although the decor and premises looked in need of attention. My only negative was that I felt that the restaurant was too dark, which made it feel a little claustrophobic, especially as it was day time. We were made to feel welcome and I thought that the colouring was great for the kids. 8/10. Service - Our server was on the ball and gave us time to browse the menu and order. He also kept us well topped up with drinks and food and was very attentive to the children. However, he did commit one of my personal bugbears which was going off for a cigarette break and coming back to the table smelling strongly of smoke. 9/10. Food - Fresh, well cooked, delicious, great variety and choice, and a fantastic vegetarian menu. 10/10. Overall: 36 Points = 9 out of 10. 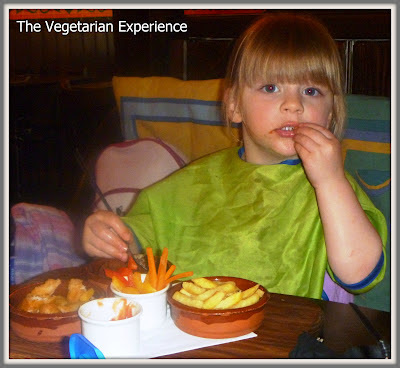 I have come to the conclusion that La Tasca is a fab restaurant for everyone - the kids are well catered for, as are meat eaters, seafood lovers and vegetarians. 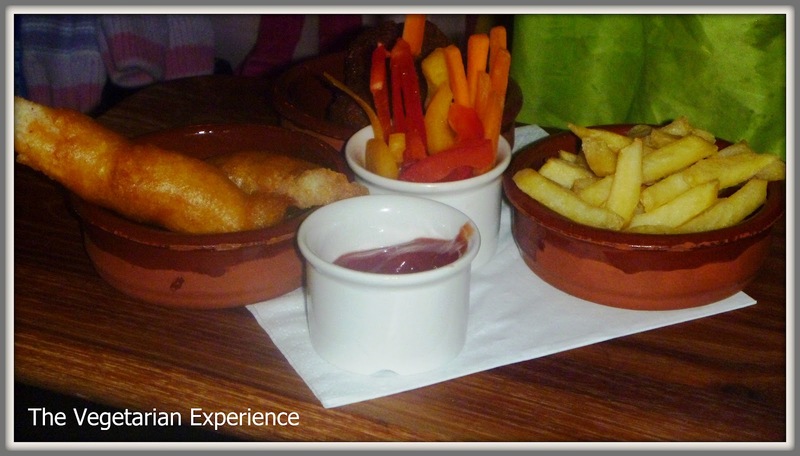 Thanks to La Tasca for inviting us to review their restaurant. With over sixty locations in the UK, it shouldn't be too hard to find a La Tasca restaurant close to you, or to come across one whilst travelling. We think that they are fantastic for the kids and the adults so we will definitely be back! Disclosure: A free meal was offered in consideration for review. 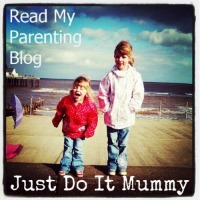 All views are my own and I was not asked to write this post. Looks like you had a great time. I wish you could get as many veggie options in Spain! Thanks - true - everything seems to be made from meat over there! 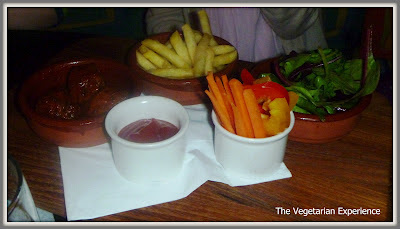 I find La Tasca has poor choice for veggies when it come to deals therefore I no longer go there.